Sammamish is a moderately sized city in the Seattle-Bellevue metro area of western Washington with a population of about 46,000. It is a part of King County. The 20-35 minute average commute to Seattle attracts families and business people who prefer a more suburban environment; homes for sale here are quite new compared to the rest of Washington and offer bigger lot sizes than some of its other suburban neighbors. 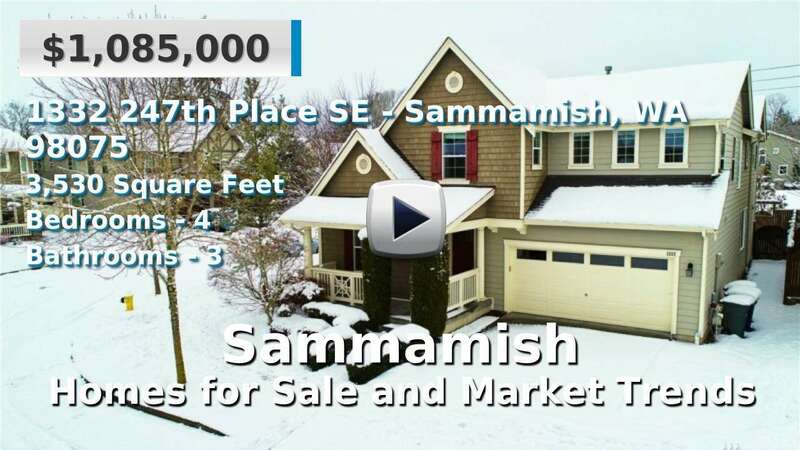 Sammamish is part of the Puget Sound region, but its main draw is Lake Sammamish. Between the lake, several other smaller lakes, Cougar Mountain and Squak Mountain natural areas, nature is never far away in Sammamish. Neighboring cities include Redmond, Klahanie, Carnation, and Issaquah. 4 Beds | 3.5 Baths | 4224 sq. Ft.
4 Beds | 3.25 Baths | 3839 sq. Ft.
3 Beds | 2.75 Baths | 1550 sq. Ft.
4 Beds | 2.5 Baths | 1920 sq. Ft.
4 Beds | 2.75 Baths | 3030 sq. Ft.
4 Beds | 2.5 Baths | 3330 sq. Ft.
3 Beds | 2.5 Baths | 2080 sq. Ft.
4 Beds | 2.5 Baths | 3230 sq. Ft.
4 Beds | 2.5 Baths | 2480 sq. Ft.
4 Beds | 3.25 Baths | 3786 sq. Ft.
5 Beds | 2.75 Baths | 3160 sq. Ft.